The Heavy Experience have released their debut LP, a 6 song epic composition named SLOWSCOPE. It is the successor of their self titled 10 inch vinyl EP. SLOWSCOPE is only released on vinyl and is cut on a 12 inch 180 gr. virgin vinyl with a CD included in the package. It’s released by Kimi Records and Úsland, the bands own label. SLOWSCOPE was recorded, produced and mixed by the band in their own studio. Finnur Hákonarson mastered and prepared for cut. The Heavy Experience have been operating since 2010 and contains members from respected Icelandic alternative bands such as Swords of Chaos, Ólafur Arnalds, Sóley, Just Another Snake Cult and Me, the Slumbering Napoleon. Also performing at the release show is Kría Brekkan. Among the notable things she’s done, she was a member of Múm until 2006 and played piano on Animal Collective’s Feels. Her music is released by the aforementioned’s Paw Tracks record label. Door 9PM / Show at 10PM. Thursday at 9PM at Útúrdúr I will be performing the Birds Carried Your Song Through the Night solo EP. I’ll have a handful of cassettes available for purchase. I’m excited to announce that we’ll be performing at two Icelandic festivals. In a little over a week we’ll perform at the Innipukinn festival alongside such great Icelandic bands as Tilbury, Ojbarasta, Lay Low, Borko, Gang Related, Sudden Weather Change, Muck, and more, more, more! At the end of October we’ll be performing at the Iceland Airwaves Festival (along with The Dirty Projectors, Swans, Sigur Ros, Doldrums, Of Monsters and Men, etc.). For full line-up, tickets, package deals, check out their website. So I’m back from tour, and I’m back in Iceland after my extended California vacation. 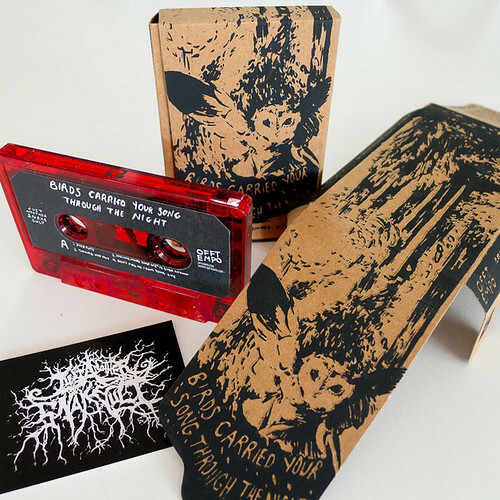 I sold out of my half of tapes, which was a good feeling. Kenneth is going to send me a handful more to have here in Iceland, but other than that if you want one order directly from Off Tempo. One of the best parts of touring with a new cassette is tape trades! Here are my new tapes. Sledding With Tigers / KIDS. split I got this when I played a show with Sledding With Tigers a couple months ago. Sledding With Tigers is a folk punk project led by a guy named Dan who is super friendly. The other side of the tape is another band from San Diego, KIDS., that was such a great discovery. Their sound is sort of reminiscent of late-90s/early-00s Moog-y indie bands like the Rentals, with a really healthy dosage of ’60s pop thrown in, lots of harmonies, super cool. I’ve been listening to all their stuff over and over again. They’re definitely one of my favorite bands in San Diego right now, so I was stoked to have them play with us at the tour kick-off show. Mandarin Dynasty – Perpendicular Crosstalk This one I’ve also had for some months, since a show I played with them at the Park Gallery. I’d heard a CD-R of this last year while on tour and had been dying to get my own copy ever since. I was really impressed. It’s a cool tape of psych-pop singer-songwriter stuff, sort of in the vein of later Elliott Smith stuff, but a bit more upbeat. Really needs to be listened to in its entirety for the full effect. LAKE – Avocado LAKE is such a cool band. They managed to sound totally smooth and groovy despite the difficult P.A. situation where we played with them in Santa Cruz. Skrill Meadow – April Fools Day Skrill Meadow is Markly Morrison from LAKE’s project of weird country music that feels at home on the cassette tape. Ethiopicks – Awesome Dance Hits from Ethiopia 1979-1989ish This is another tape I got from Markly Morrison. Sounds as advertised. Antarctica Takes It! – Contellations I actually play a tiny bit of guitar on this album. It’s in the vein of bands like Camera Obscura and Belle & Sebastian, with a bits of 60s soul influence showing through. Antarctica Takes It isn’t playing any shows right now because Dylan is working on his comic book Burger Dude, but I stayed with him while up in the bay area. C&F by Antarctica Takes It! Each Other – Taking Trips I’d planned to visit Big Sur during a day off on tour, but those plans fell through, so I stayed an extra day up in the bay area to catch my friend Erin’s band play a show. They were touring with a Canadian band called Each Other who totally knocked my socks off. 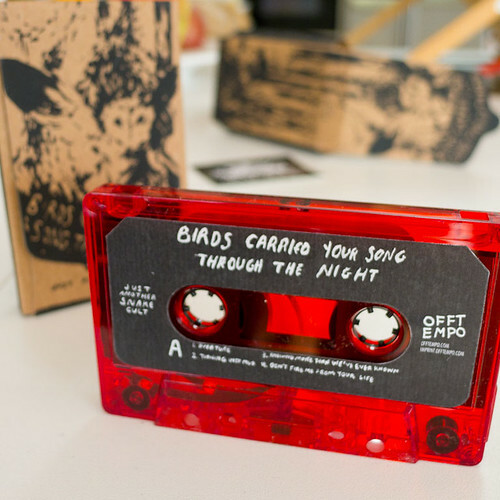 This tape almost doesn’t do them justice, but it’s pretty damn cool nonetheless. It’s noisey super angular rock ala Women, with much of it riding on their tight vocal harmonies. It was amazing the sound they accomplished despite being just three people. Also check out their 7″ single… it’s REALLY good. Good Amount – Swimmer Christian Filardo is a dude who runs a net label called Holy Page Records that’s put out a couple compilations I’ve contributed to. He also does a band called Good Amount. I randomly met them in Santa Barbara, where they were also touring through. This is a nice ambient electronic music tape. Stephen Steinbrink – I Drew a Picture I played a show with Stephen last year, and so I was excited to catch him play at the Che Cafe the day after my tour. Stephen is a “singer-songwriter” and home recorder who is a delicate master of his craft. As soon as you pop this one in Steven hits you with his super tight harmony singing, and it’s like bam this is awesome. This one sounds so cool. Some textures are reminiscent of French groovesters, Air. Other moments vaguely recall Satanic Panic-era Of Montreal. The warbly mellotrons and honkytonk pianos, the slap tape echo, punchy drums, and 80s-tinged production of tracks like To Be New Again all translate especially well on cassette tape. I think there’s also something to be said for actively engaging the music you’re listening to. With a cassette you pick it up and put it in a machine to listen to it, and half-way through you flip it over to continue. It takes deliberate effort. With a computer on the other hand, the listening process is so passive, especially if you’re using giant playlists or have your whole library on shuffle. But I think the most interesting thing about cassette tapes is in the strengths and limitations of the medium. Ok, so maybe it’s mostly limitations. But it’s cool to see how people work with the frequency response and saturation characteristics and how the medium can become a part of the sound of the recording in a pleasing way. All these tapes are super cool. 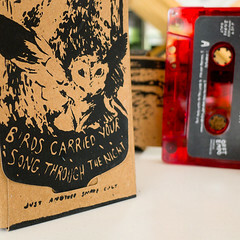 The cassette-sound aesthetic of a few of them — especially I Drew A Picture and April Fools Day — has really inspired me. I’m taking notes! I look forward to doing another one.